Elle’s hatchlings are growing and will need harvesting in a few weeks. Then there’s the other fry pond outside which has a few fry from the last shiro spawning – no great numbers, and I’d be surprised if there are even 100 in the pond. Nevertheless, it needs to be kept clear of pond weed, harvested and I’d like to drain it down for the winter. It’s been nice to hang onto last year’s tosai for a little longer than I planned; seeing them in the ponds has given me the chance to appreciate all the work and challenges overcome that those kohaku’s represent. And I’ve hung onto them so long now that they about to turn nissai. The way I count the age of the fish is to count the number of completed summers . So last year’s kohaku’s are coming to the end of their second summer and are turning nissai. We've started to take pics and video of the fish we need to move on, and I'm going to be as tough as I can on the decision making - I really need to get the numbers down to 10-15 at the absolute maximum. Preferably less than that. The growth I’ve achieved with them this summer has been poor compared to the spring. They’ve all nudged on a few cm’s and the contrasting priorities of exhibiting koi at shows, breeding, harvesting etc has meant that growth has been significantly impaired. For example, this kohaku was 46cm when Kevin Ellis visited back in mid June, and we measured it at just 49cm last weekend. That’s only 3cm in almost 3 months. I'm quite happy with it though... and this one will be staying with me at least another year. This is a quick snap I took of it last weekend, and gives you an idea of how it's coming along. I have pictures of this kohaku at several stages since it was a fry, and I'll write up an individual the case study over the winter. Seeing how the kohaku’s have developed over the summer has infused me with a little bit of extra experience, and the vast majority have grown a bit and developed a better body with the red pattern elements maintaining position and still looking good. Two kohakus’s have developed some secondary hi – one quite badly on the body, which I’ve not seen before. And one has developed a shimmi – which ofcourse had to be one of the prettiest kohakus! Shimmi’s come in different types, and can be as simple as a deposit of dark colour particles – almost like a tiny droplet of dried soup. These can be literally flicked off with a finger nail, but the type my maruten kohaku has is of a more permanent type, with the colour being in the scale rather than particles sitting on top of the scale. It may be possible to do something about it, but I’m not going to try – it’s going onto ebay sometime soon. Last weekend was also the benching for Kangei Koi Club’s annual garden show. This is a koi show where the judge travels round each pond entering the show, observing the benching as it happens. The koi are pictured and benched and then the judging is completed at a later date. Last year, I entered 2 kohaku’s and 1 tancho, all going into size 1. The kohaku’s came first and second out of 3 in size 1 kohaku, giving me a good start exhibiting my home breds – but this year will be a much better test, as I entered kohakus into size 1,2,3 and 4. With the best few being in size 3. I also entered one tancho too, and some of my brood fish. This is one of the kohaku's we entered - from the July 14 spawning. It's lengthened out nicely to 44cm, and was looking pretty good on the day. 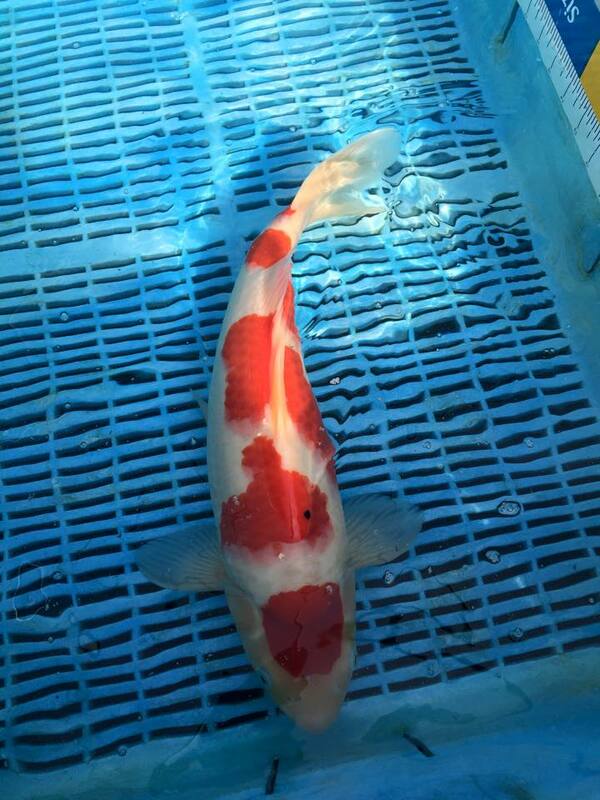 Some roughness felt on the gills during the handling of the koi suggests that this is a male kohaku. We’ve had a few sunny days, starting last Sunday and the weather report shows the warmer (it’s not that warm..! but warmer than the last few weeks) period will last the rest of this week and then we’re into wet and windy, and then cooler weather. I just hope Elle’s hatchlings make some progress this week – it’s crucial. They’re still a long way off harvest size and we just need them to grow another cm or so, and that would bring them into a harvestable size. I’m also going to give the Shintaro showa a final run out. It’s already a bit late, but I figure I have one more chance to spawn her this year – and it’s got to be this week. I’ll go with the same method that I used for Elle; that is to leave her with some males in a small recirculation tank for a few days – I’ll use the same “tea cup” tank as I used with Elle, and the last shiro spawning. I’ll ensure water temps are really warm and the tank is packed with spawning brushes. Everyone, please cross your fingers. I need it! Finally, here's another update vid of the May 15 keepers; I could do with selecting through them again sometime soon.